This entry was posted in Movies and tagged Adam Scott, Benedict Cumberbatch, Corey Stoll, Dakota Johnson, FBI, gangster film, good, invetigations, Jesse Plemons, Joel Edgerton, Johnny Depp, Julianne Nicholson, Juno Temple, Kevin Bacon, movie reviews, movies, not great, rats, Whitey Bulger. Bookmark the permalink. I also recently watched this one and totally agree about Depp, it’s without a doubt the best he’s been in a long, long time. The rest of the movie is solid enough, too. Not bad, really! Yeah, I really hope Depp starts doing some more serious roles again. Definitely not bad, solid but not great. Nice review Zoe. It’s exciting and tense, which is all thanks to the great cast. Thanks Dan! Definitely the cast that carries this one. 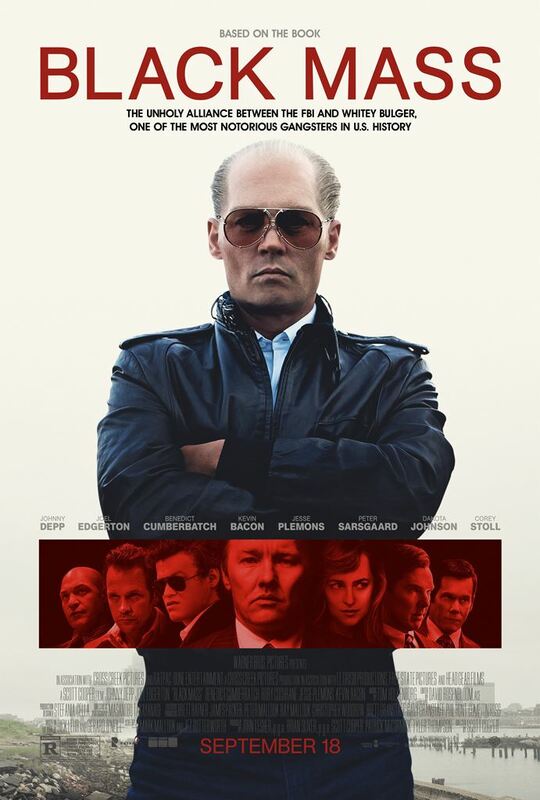 I don’t usually watch movies like this I made an exception for Black Mass since I live so close to Boston. Before his capture, Whitey Bulger had taken on an almost mythological persona here akin to “He Who Must Not Be Named”. I thought Johnny Depp did an amazing job portraying someone who committed monstrous acts, but in the end is just a man. Great review Zoe! Not for It. It hopes It has a lovely weekend. Probably not It’s thing. It must have a grand weekend, too. This is honestly the first review I’ve read that makes me want to see this movie!!! I like hearing how we see how good Johnny Depp is 🙂 for once! Ee’s a great guy…but not in so many good movies….. Thanks a mil, Em! Worth checking out, though it will doubtfully be your favourite gangster movie, but just to see Johnny Depp do something with substance again? Worth it! I totally skipped over this when it came out… I’ll have to give it a try, it sounds like Depp is actually good here! Give it a shot, Depp was actually worth the watch! I never got around to seeing this and then I kind of lost interest but I’d still like to catch it at some point. Not something you actively need to seek out, but worth checking out if you do stumble across it. Not a bad film and not a great one – but it was good. Great review. Thanks, definitely see eye to eye on this one. 😦 Isn’t that just the worst? I mean, he was always so good, took so many different types of roles, then he just got boring. Definitely a return to form for him here, and the movie is alright, albeit not as gripping as it could have been.